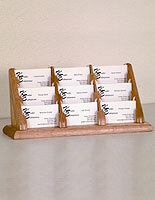 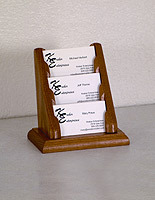 These mahogany business card displays are made of solid wood and feature a tiered 3-pocket design. 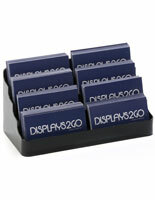 This means that each of the desktop accessories can hold up to (90) contact cards, making them great for saving space. 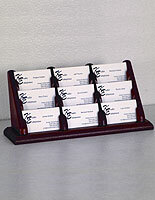 With these business card displays, users can dispense promotional information in the workplace or at an event. 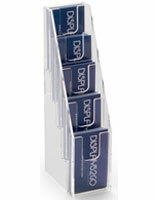 For example, the tiered stands can be used in car dealerships, travel agencies, doctor's offices and law firms. 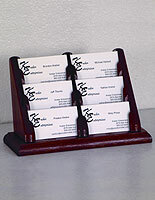 Alternatively, the promotional card displays can be brought to trade shows and banquets for spreading company awareness. 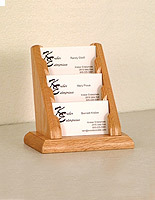 The wood desktop accessories are made to be compact and have a footprint of only 5.8" x 4.4".